Caveat: To me, "imperialism" and "colonialism" are dirty words, reminiscent of a violent loss of identity and language, bigotry, cultural repudiation, misappropriation, starvation, and theft. "Colonialism" implies the belief that a land and a people can, and indeed must, be conquered and civilized. It reflects a sense of entitlement and overinflated ego at its absolute worst. Given the history of British imperialism, it is only during my visits to Ireland does colonialism affect my travel writing or penetrate my mind. Ireland is the country I've visited most often. This isn't because I find Ireland fascinating or that I've found a lost sense of "home," although there's a lot to appreciate about Ireland: It's difficult to go anywhere without encountering something historically interesting - which I love - and cows or sheep cause traffic jams often enough - which is equal parts funny and frustrating. My mother's parents were from Ireland, and many of my mother's relatives - mostly cousins at this point, and two aunts-by-marriage - still live scattered throughout, so because of its small size, going for a visit is easy. I've yet to actually rent a car and drive in Ireland myself, but visiting my parents and cousins in Ireland means I've been chauffeured all over the country (only very occasionally by tractor). It's such a small country that one can get from Dublin to Arigna, where my parents live for part of the year, two-thirds of the way across the country, in just over two hours. Galway, the major city on the west coast of Ireland, is also just over two hours' drive from Dublin. It can take just over seven hours to drive from Londonderry, on the northern tip of Northern Ireland, to the southern tip of Ireland. Spurr says that the "problem of the colonizer is in some sense the problem of the writer: in the face of what may appear as a vast cultural and geographical blankness, colonization is a form of self-inscription onto the lives of a people who are conceived as an extension of the landscape" (7). 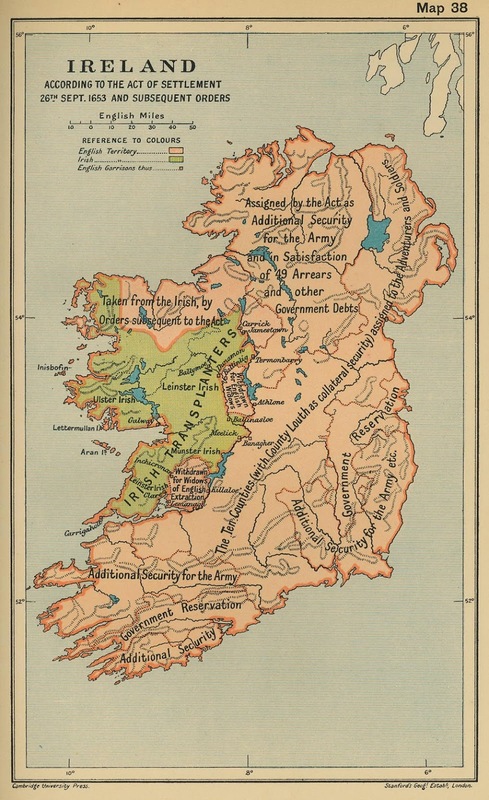 The presumably British cartographers have subsumed Ireland's landscape as a means of overtaking their culture, as you can see in this map of Ireland in 1653, when Cromwell led the conquest of Ireland by the forces of English Parliament during the Wars of the Three Kingdoms. Throughout Irish history, Irish Catholics were forbidden to speak their language, practice their religion, play their music, or own property, including the land on which they lived. Ireland was perceived as an extension of England, in some cases used to pay off debts, and in other cases as a means of reward for service. In the above map, you can see that the Irish were pushed off to the western part of the country, as has been done throughout American history, with the Native Americans, who were pushed farther and farther west and into smaller and smaller spaces. Traces of the British are still visible in the Republic. During one visit to Ireland, my mother and I drove down to Clonmacnoise, a mid-sixth Christian monastery founded by St. Ciarán, which had been sacked by British troops in the mid-1500s, and was finally returned to the Irish Government in 1955. Since the 18th Century, Church of Ireland services have been held on site in Temple Connor, and although everything else was open for exploration, that particular building was continually padlocked. Perhaps I merely corroborate Bassnett’s assertion that I, like, many other women travel writers, have different motivations for writing, in that I a "physical dimension...to engage with the everyday as an end in itself, not as a means to a different end" (230). Land ownership for me is not particularly important, for example, but it had been very important to my mother, who understood that in many cases, land ownership was equivalent to power. Similarly, education had been understood to be extremely important as a means of protection against loss; you might lose your land, your house, and your horse, but education inoculates. My motivation for writing can be echoed in Bassnett, who says that travel permits the redefinition of self (234), and my "gaze" is more likely to reflect the "demise of a world-view that separated us from them" (240). One of the reasons I write about my travels is not only to remember what's happened, to have a written (and hyperlinked) record of where I've been, but to see connections between myself and others, even when seeing the differences in personality, culture, and history.